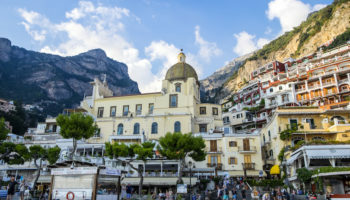 The city of Sorrento is found in Campania region of Southwestern Italy, and it is a spectacular getaway spot for visitors from around the world. 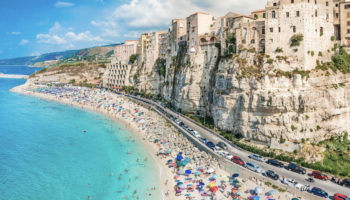 Sorrento is built right into the cliffs overlooking the Gulf of Naples, so there is always a view of the water as well as a refreshing breeze. Since Sorrento is right on the water, many visitors come for the coastal walks as well as the lovely beaches. To top it off, Sorrento is home to countless historic and cultural attractions like the Roman ruins of Villa Pollio. 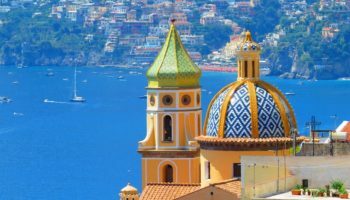 If you’re lucky enough to come this way, here are some fantastic day trips from Sorrento to add to your itinerary. The island of Ischia is the most developed and largest of the islands in the Bay of Naples. Ischia is directly accessible by ferry from Sorrento a few days in the week. This beautiful island only attracts a fraction of the day trippers that head for Capri in summer though there is plenty to see and do. 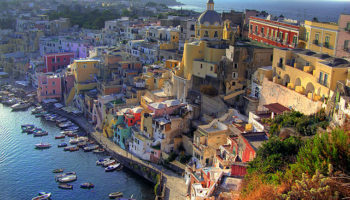 Major draws to Ischia include its many sprawling spa towns, abundant gardens and stunning scenery. You can also visit some of the island’s famed villas including Villa La Colombaia, which is now surrounded by a gorgeous park. Don’t leave without enjoying the island’s beaches, particularly the popular stretch of sandy coastline known as Citara. Just under two hours by car from Sorrento is Paestum, a sleepy destination that is nonetheless home to some of the world’s best preserved Greek ruins. The settlement of Paestum was founded approximately 2,600 years ago, and shortly after that founding the Greeks built three impressive structures in Paestum. These temples, dedicated to the gods Hera, Poseidon and Athena, all stand to this day, and are surrounded by other ruins like Greek gymnasium and the remnants of a city wall. 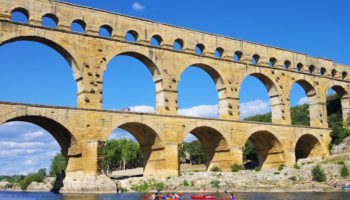 You can also explore the museum onsite, which explains more about the former Greek settlement and how the structures were built to withstand millennia of erosion, wind and weather. One of the most exciting day trips you can take from Sorrento is to the city of Naples, which you can reach by train in about an hour. Naples is the capital of the Campania region of Italy, and it is one of the country’s biggest, most vibrant cities. Naples is home to several interesting palaces and castles, the most interesting of which might be the Castel dell’Ovo at Porto Santa Lucia, or egg castle, which is located on a small peninsula just off the coast. While in Naples, you should also make time to see the Royal Palace, explore the 2,000 year old Napoli Sotterranea aqueducts that run underground through the city and try some of the famous thin-crust pizza margherita for which Naples is famed. Just next to Pompeii is the settlement of Herculaneum. Although it is not as popular as Pompeii, Herculaneum suffered the same fact after a volcanic eruption nearly 2,000 years ago. 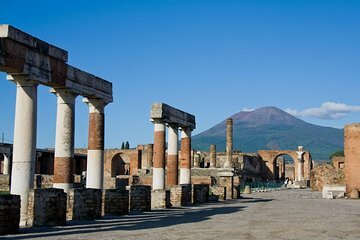 Many of the city’s ancient buildings are actually better preserved than in Pompeii, which makes it ideal for historical and architectural enthusiasts. When you buy tickets for the ruins of Herculaneum, you’ll be able to see the baths that were fed from a natural well, incredible mosaics that are still installed in the House of Neptune and Amphitrite, a luxurious waterfront dwelling known as the House of the Deer and the Samnite House, a courtyard residence that is believed to the oldest structure still standing among the ruins. Behind the ruins of Pompeii and Herculaneum, you’ll see the towering peak of Mt. Vesuvius. 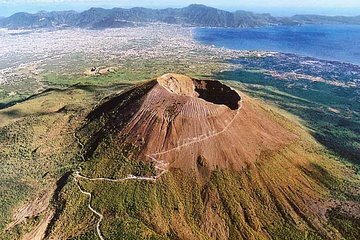 Although it is famously known for its eruption in 79 AD, Vesuvius is now a dormant volcano in a gorgeous national park that is only an hour from Sorrento by car. This is a spectacular place to enjoy world-class views and to get outdoors and be active. A popular way to explore Mt. Vesuvius is by hiking along the trails of the crater. From some vantage points around Mt. Vesuvius, you can even get panoramic views of the Bay of Naples. You can take a water taxi directly from Sorrento to the island of Capri, which is found just three miles off the Italian mainland’s coast. 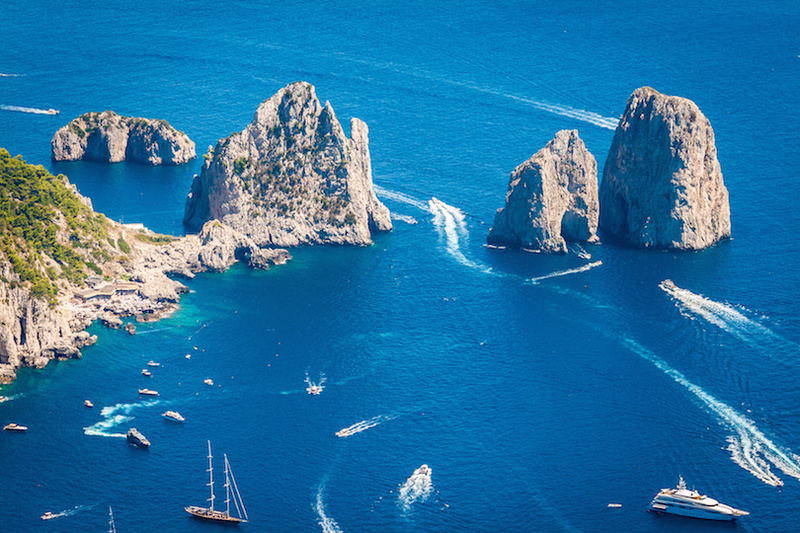 Capri has long been a popular island getaway, was favored by the Roman emperors and is even known as the Isle of the Sirens. Today, visitors to Capri can see the Blue Grotto, or Grotta Azzurra, which is a small cave once used as a bath by the Romans. 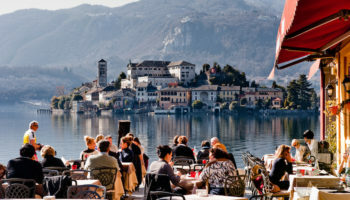 You might also want to tour some spectacular homes like Villa Jovis, the former residence of Emperor Tiberius, or the 20th century Villa San Michele. 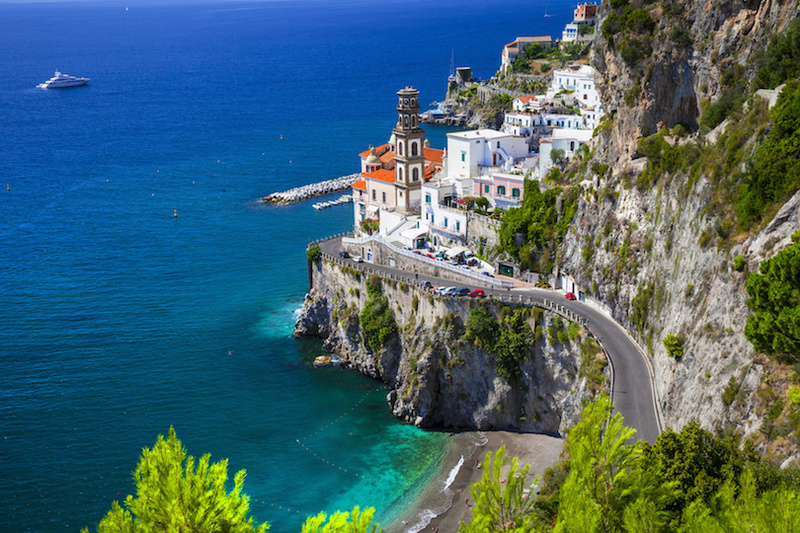 The Amalfi Coast is a stretch of coastline that runs for about 25 miles along the road called Strada Statale 163. This drive lets you overlook the water virtually the entire way, providing unparalleled views. 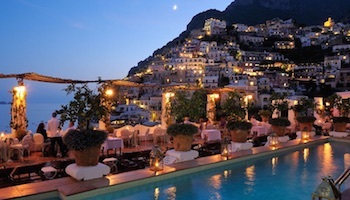 Plus, the Amalfi Coast is just an hour’s drive from Sorrento. 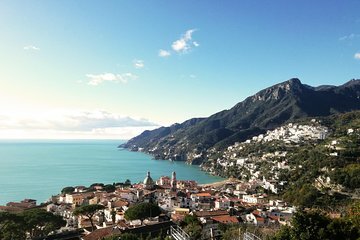 While there are plenty of beautiful vantage points along the route, be sure to stop at the actual town of Amalfi. 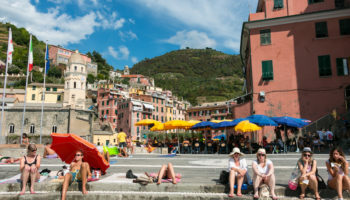 There, you can tour a 10th century cathedral, take a stroll along the pebbled beach or just sip a glass of wine or limoncello at a bar or cafe overlooking the town’s world-famous marina. One of the most popular day trips from Sorrento is the city of Pompeii, which is just 15 miles north along the Italian coast. 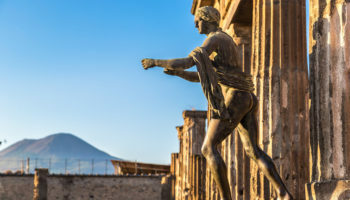 Pompeii has a history that dates back more than two millennia, but most people know it for the enormous volcanic eruption that took place in the region in the year 79 AD. The eruption essentially preserved the ancient city, and excavation means that you can get a glimpse into everyday life from nearly 2,000 years ago. See the 20,000 seat amphitheater, the street of tombs and the stunning murals in the House of the Vettii.